Baptists have a rich and wonderful heritage. But I have discovered through listening and reading that many persons in our Baptist churches are unfamiliar with this legacy. 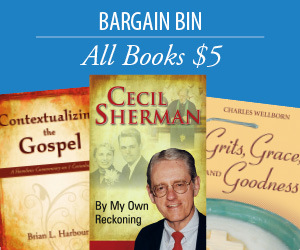 There are many fine books that have been written about our Baptist history, but I have observed that few persons, especially laypersons, are willing to read these lengthy books. I have attempted in these chapters to present our Baptist heritage in a few pages. Included in this revised edition is a leaders guide terrific for facilitating group discussion and study. William Powell Tuck, a native of Virginia, has served as a pastor in Virginia, Kentucky, Louisiana, and North Carolina. He has also been a seminary professor and has taught adjunctively at several colleges and at the Baptist Theological Seminary at Richmond. He is the author of twelve books, including The Lord’s Prayer Today, Getting Past the Pain, and Authentic Evangelism. He received the Parish Pastor of the Year award from the Academy of Parish Clergy in 1997. He is married to Emily Campbell and is the father of two children and has three grandchildren. He resides in Midlothian, Virginia. Bill Tuck’s book is important. It is a successful attempt to restate without misshaping the essence of the Baptist tradition. It is important, in my judgment, that this statement comes from a Baptist pastor, one who understands how the heritage of Baptists connects with the needs of people in the pew. This book's major value is that it helps persons in pews understand key principles that drive the Baptist story. 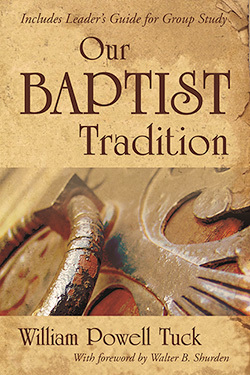 The new chapter, "Our Baptist Tradition: A Leader's Guide," enhances the book's value for church study classes. For each chapter, the guide summarizes key points and offers "Questions for Reflection" and "Activities." Amen to Tuck for making Baptist history appealing and practical. Dr. Tuck gives his readers a dependable account of the Baptist heritage, and he does it with the learning of a historian, the clarity of a theologian, the power of a preacher, and the wisdom of a pastor. His stories, and he tells a lot of them, are winsome, and his ideas are momentous. If you want to know why so many people are urging us all to learn about our Baptist legacy and to be faithful to it, read this book and you'll understand. Bill Tuck knows the Baptist world from the inside. His insights are insightful and sensitive to the beloved traditions of our faith. His words give us glimpses of the rich heritage that is ours as Moderate Baptists and gives us hope for the days ahead. At this crucial time in religious history, I do not know of a better resource for those who want to be well informed about the tradition that has enabled the people known as Baptists to provide such significant and lasting contributions to the landscape of faith. The reprinting and updating of this highly readable yet scholarly work, will once again give me an indispensable book to place in the hands of congregations during the intentional interim process of reaffirming and anchoring their identity. Bill Tuck has said it well and said it plainly. My hope is that this reissue will find the wide audience it deserves.